I know what you’re thinking, “ew, Aimee. Why the eff would you ever touch and cook liver?” Well liver wasn’t exactly my first, second, or third choice of cuisine either. I’ve read that there are extremely beneficial traits that come with eating organ meat, however, because I was grossed out, I never read any further. Sure, thinking about consuming liver is gross, but animal liver has a lot of upsides to healing your body and gut. Ever since my surgery since October, I’ve resumed getting acupuncture once a week to help heal my body and prepare to try again for our rainbow baby. However, because we moved shortly after the procedure, I was forced to seek out seek out a new clinic in our new neighborhood. As hesitant as I was to “trust” a new acupuncturist, Kelly Maher has been nothing short of amazeballs. Besides being incredibly personable and warm, she has introduced me to more of the Chinese way of thinking. For example, she has helped me to realize the importance of rebuilding and restoring my “qi.” Because we are still grieving from our loss, my qi has been “stuck” and still recovering. Kelly mentioned that combining acupuncture, herbs, and consuming organ meat (specifically liver) is the perfect trio unclock my qi. Before I embarked on purchasing the gross looking organ meat, I did a lot of research of my own. Surprisingly, I found that liver is one of the best healing foods out there today, more than a lot of vegetable superfoods. Loaded with a crap ton of vitamin B12, iron, and Vitamin A (folate), liver outperforms a bunch of natures richest ingredients. These three ingredients alone are imperative to consumer for fertility and preventative birth defects. Next on my list was to find a band that sold clean and non-crap filled animal products. Out of many companies on the market, US Wellness Meats stuck out most to me. USWM is everything I want in a brand: it believes in only producing non-antibiotic, grass fed only, and against grain products. They also write every ingredient used on their website. A match made in heaven. 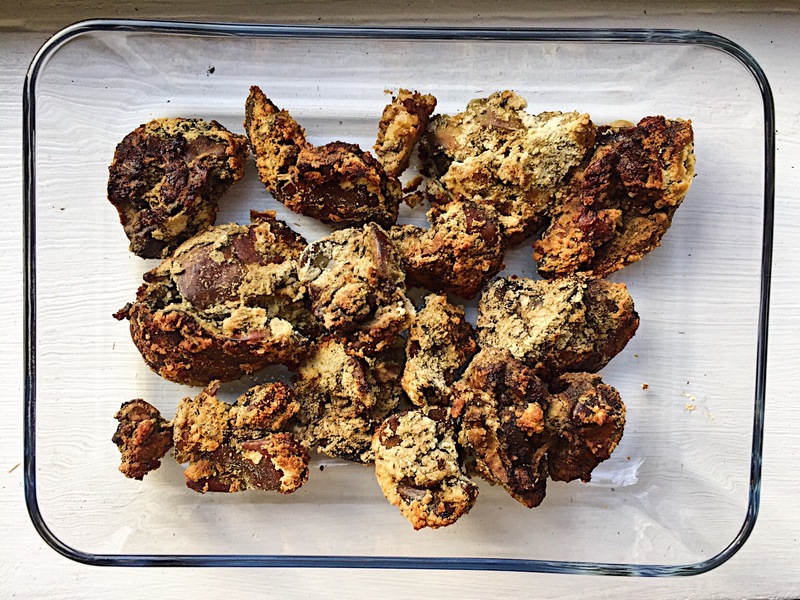 Once I got over the initial grossness of touching chicken livers and dealing their iron-y taste, pairing them with different ingredients surprisingly tasted pretty delicious. In all honestly, I’ve grown to love cooking them, especially because I believe that it’s for a good cause. Happy qi=better chances for our rainbow baby. For those who are extremely hesitant on trying out the livers, don’t worry, I was too. But this super simple recipe I created is a great first step to expanding your liver reportoir. -Heat the oven to 375 degrees; Drain the soaked livers back into a strainer to remove the soak ingredients and re-rinse with water. -While the excess water is draining off, get the coating stations ready in separate bowls. And I’d highly advise for you to use tongs to touch the livers. 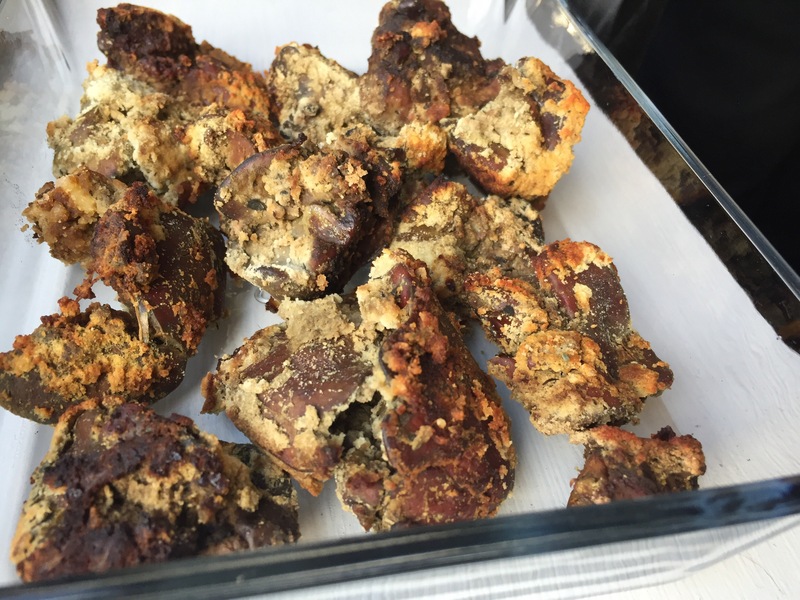 -Dunk the livers first in coconut oil, then dredge in tigernut flour, then in coconut flour. Once completed covered like a pseudo chicken nugget, lay on a baking pan. Continue until all of the livers are coated. -Once all livers have gone thru the coating process, take a pinch of salt and very lightly sprinkle across all of the livers. -Pop into the oven for about 30-40 minutes or until you cannot see any red blood (gross I know). Once these are completely cooked, they will be crispy on the outside and as soft as chicken on the center. If you need any dipping sauce to counteract the iron flavor, try my favorite KC Natural sauces or any sort of AIP/Paleo sauces listed at Phoenix Helix.